America's deer population is apparently no longer content with simply jumping in front of our cars on country roads. They have taken their war on our freedoms to a new, horrifying level by jumping off overpasses and flying into our cars as they travel down the highway. 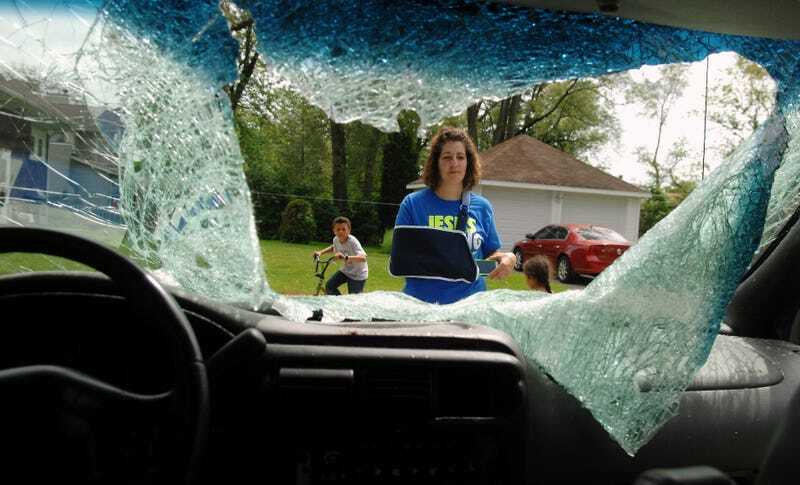 Illinois' The Daily Herald reports that Heidi Conner of West Dundee was driving in her minivan on a tollway, just minding her own business, when a deer leapt from an overpass and came crashing through her windshield. She was traveling at 70 mph at the time. The deer "came to rest," as the newspaper puts it, inside the van with its head next to the glove compartment between Conner and her 13-year-old son riding passenger. They had minor injuries, but her three other kids in the back were fine. The deer wasn't so lucky, and the minivan was also totaled. Conner kept control of the minivan after the crash, but said she was scared to turn around after stopping, fearing her kids might be dead in the back. Her doctors said the crash could have killed her if the deer smashed into the vehicle just inches to the left. Well, I'll be looking up from now on whenever I go under an overpass. Thanks for instilling fear in us all, deer.